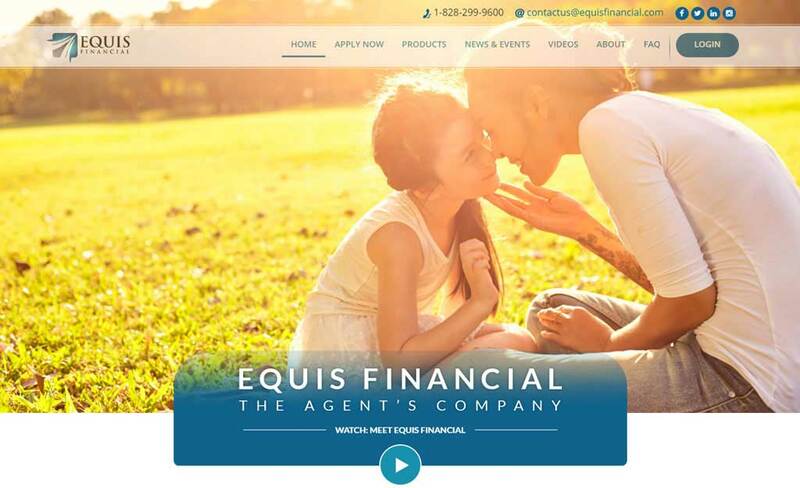 Equis Financial is an insurance agency that helps people across the United States find the Life insurance and retirement solutions they need to protect their families and their future. They offer insurance products from leading carriers in the country, so that their agents can offer and assist clients choose the right offering that suits their budget and needs. 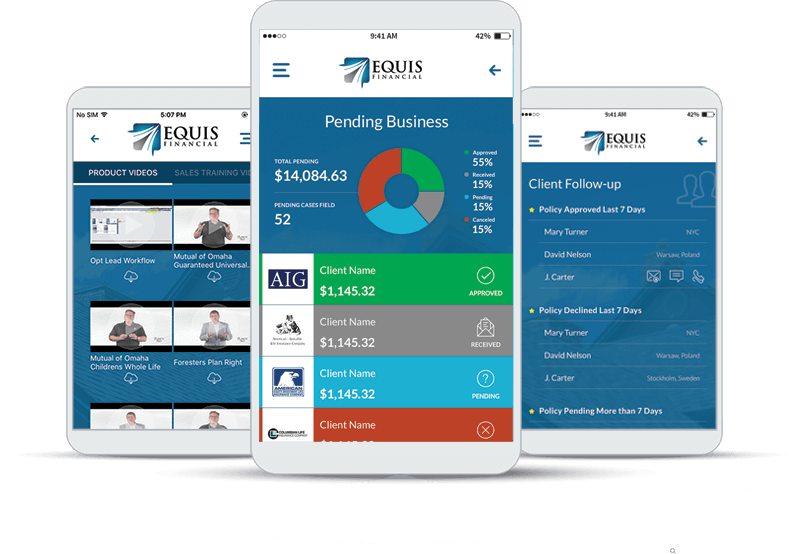 We have partnered with Equis Financial to develop one-stop integrated solution for agents and back office users for better data flow and improved process efficiency. The project started with workshops with Equis Financial to identify the larger goals and technical requirements of the project. 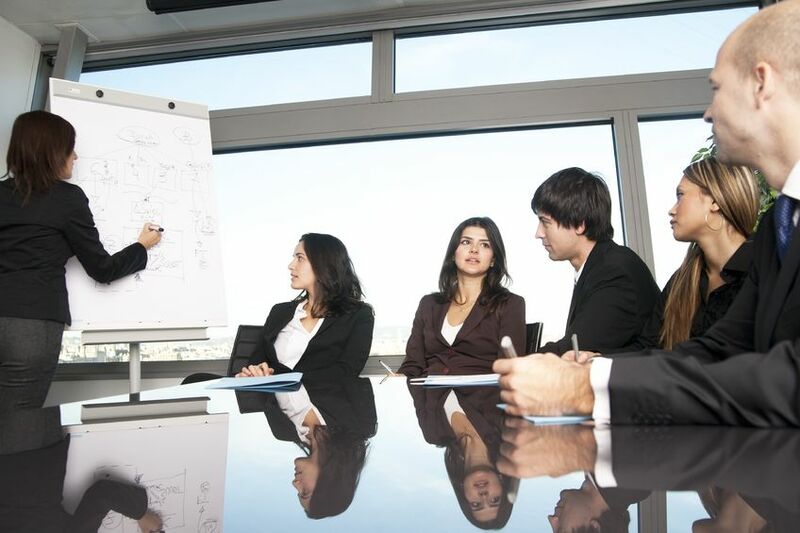 With goals identified, we had multiple online meetings and brainstorming sessions to understand existing business process flow involving common user tasks and automation opportunities. 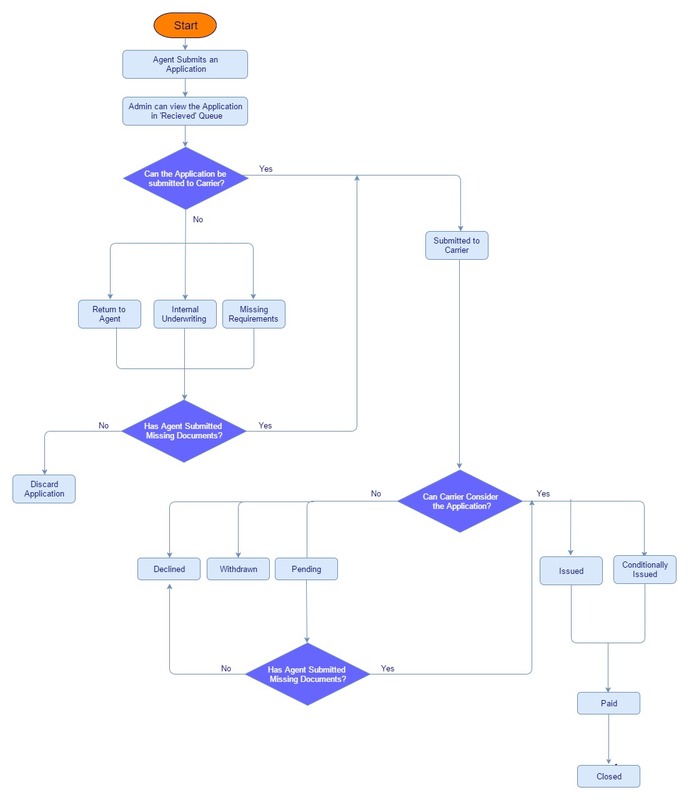 We documented all the automation requirements based on our expert analysis of the existing information, designed the new process flow in close collaboration with the client. Our business analysis team created a detailed task-oriented plan based on the types of users. 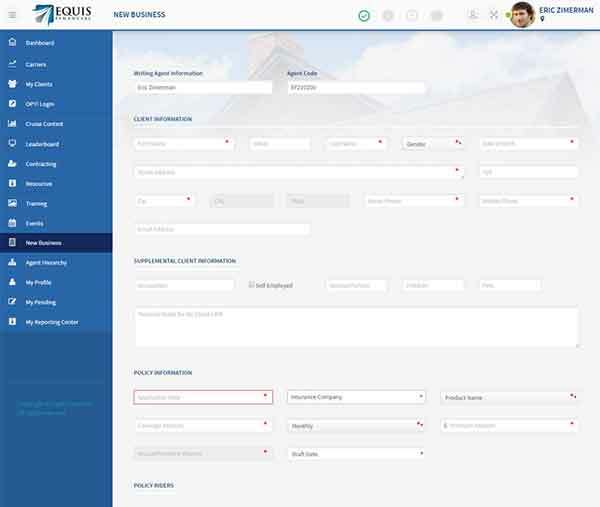 Once the top level structure of the application was finalised, we worked closely with an agent support team at Equis Financial to understand the design requirements of the new system to come up with wireframes. The most challenging part was to present the complex information in a user friendly way using graphs and tables. As part of the initial evaluation process, we identified that Equis Financial was using 4 different small applications running independently using different frameworks. We designed a master framework and integrated these 4 micro applications into a single one. Our solution expert team created a master architecture plan using Service Oriented Architecture principles for better code reusability. 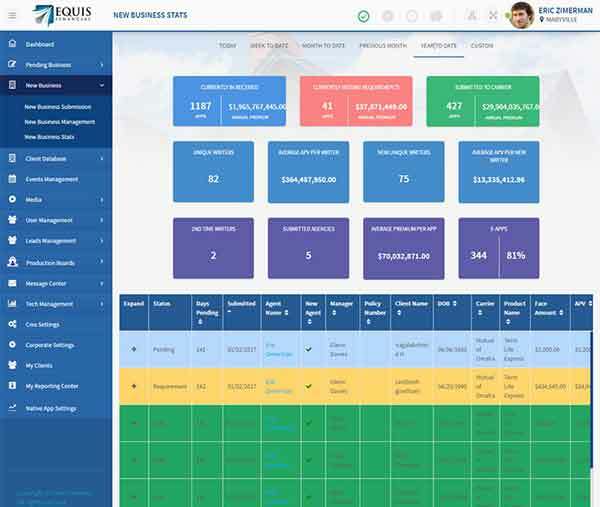 Given the amount of data that needs to be presented to the Equis Financial staff team for managing the daily operations, choosing the right layout was important. 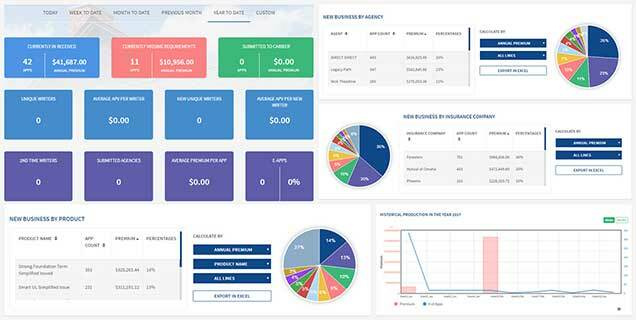 We designed interactive visual dashboards,which show the information breakdown of each agency. As part of the initial assessment of the existing application, our engineering team found it was using an old technology stack, which resulted in poor performance and reduced scalability. 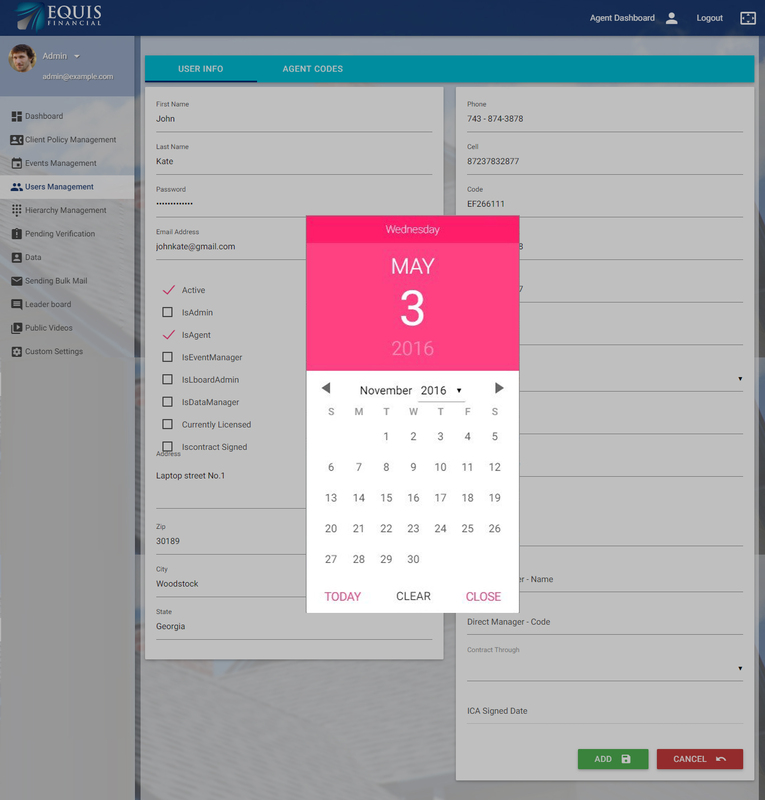 We reengineered the entire application using AngularJS/PHP 7 to make it intuitive and responsive. Our solution experts put in the best practices to make the application secure, fast and scalable to handle a larger user base. We have also made sure that the application was compatible with all major browsers and multiple display sizes that was a big pain point for the client previously. Insurance agent’s important work was to get prospective customer leads and connecting with them to offer products. 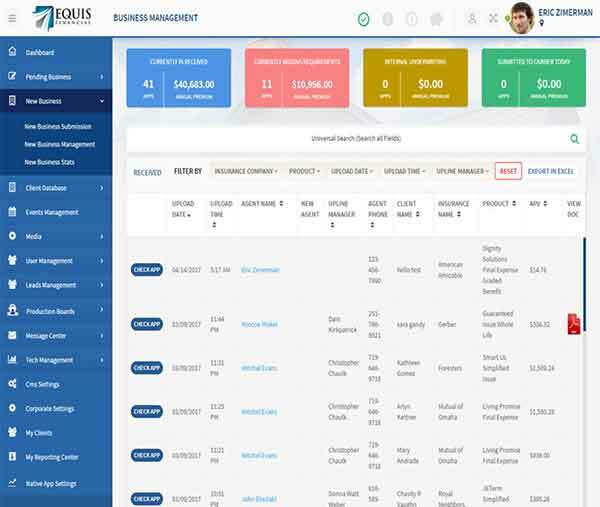 Equis Financial currently provides leads for their agents and this lead generation process had a lot of manual activity. We started automating various parts of that process to add more customer touch points and convenience. Another area we identified was the Events conducted by Equis Financial for their agents, which had lots of manual process using Microsoft Excel. 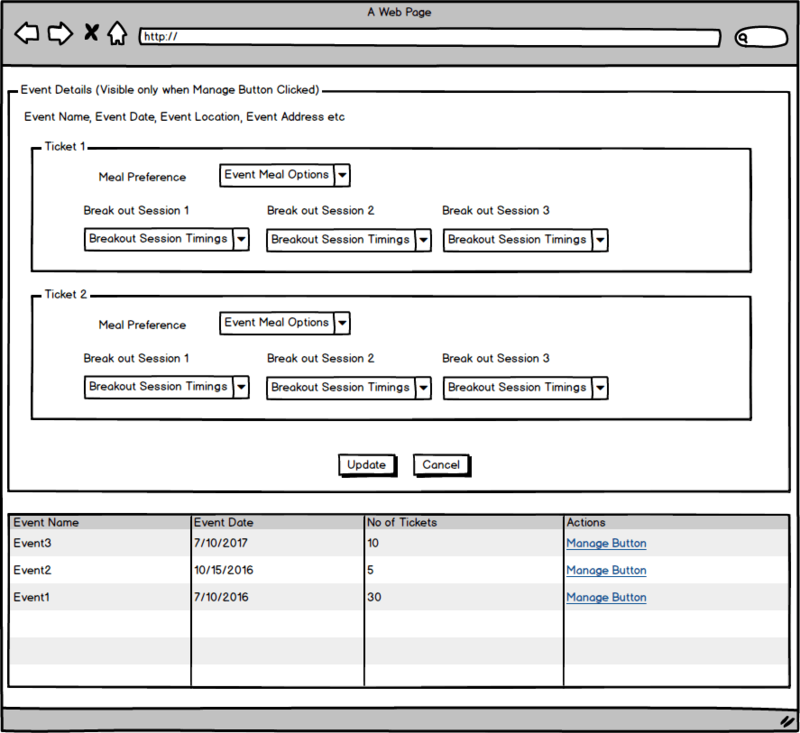 We developed a micro application where agents can register for events, buy tickets and subscribe for sessions. Insurance agents spend 80% of their time in the field meeting clients, setting up appointments or traveling. Having access to all the information about their clients in the field helps them plan their day much easier. We developed Android and iOS Apps for both mobiles & tablets, which help agents setup appointments, set reminders for follow ups, check Business done vs Targets. We enhanced the mobile Apps with a learning module that helps agents improve their skills and connect to experts for any questions. Insurance Agent needs to submit client documents when they agree to take an insurance service as per the insurance carrier guidelines. The staff team at Equis Financial validates each of these documents before sending them to carrier for final approval of the policy. The application goes through a complex set of checks and data exchanges between Equis Financial and agent before policy gets approved. This process involves keeping all the facts documented, tracked and followed up, which otherwise was happening manually. 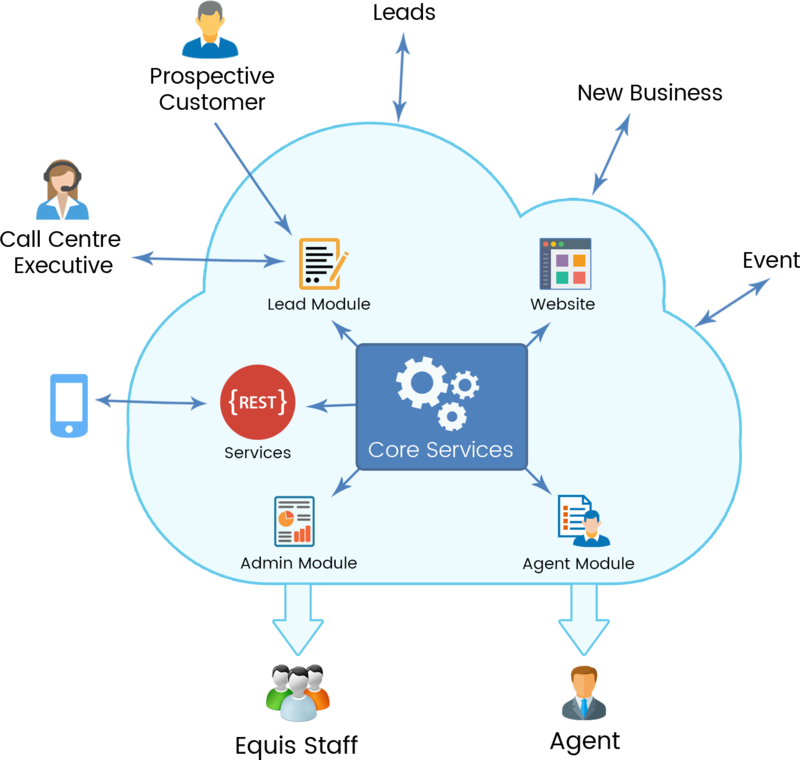 We designed web and mobile modules for submitting applications, validating and checking status for agents. We also integrated communications with carriers, so that most scenarios are auto handled without manual intervention. 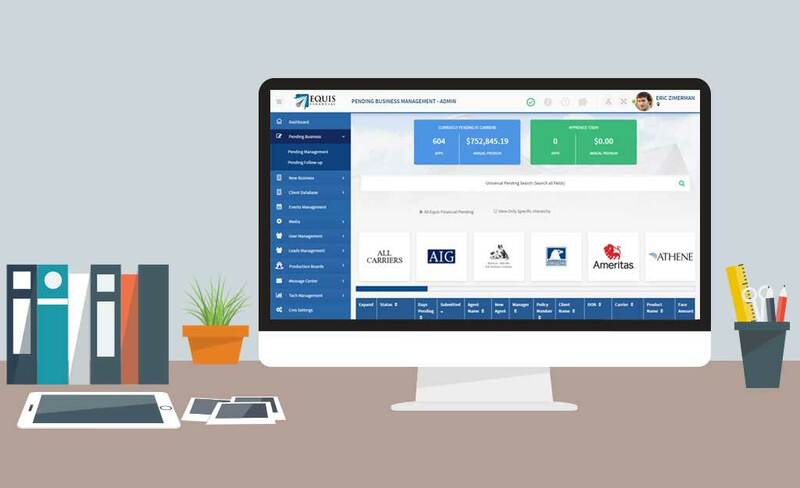 We have successfully created an easy to use online collaboration platform to connect Agents, Clients and Equis Financial team. 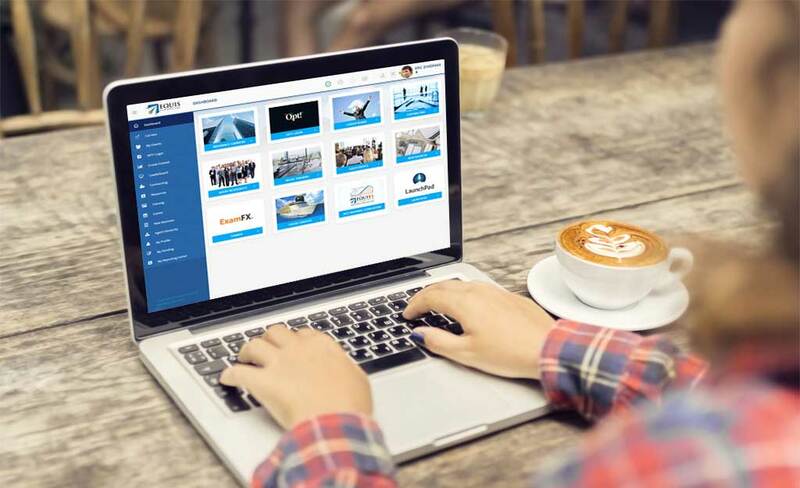 By designing intuitive customized solution for different users, we were able to improve performance of the existing system and improve total business efficiency. 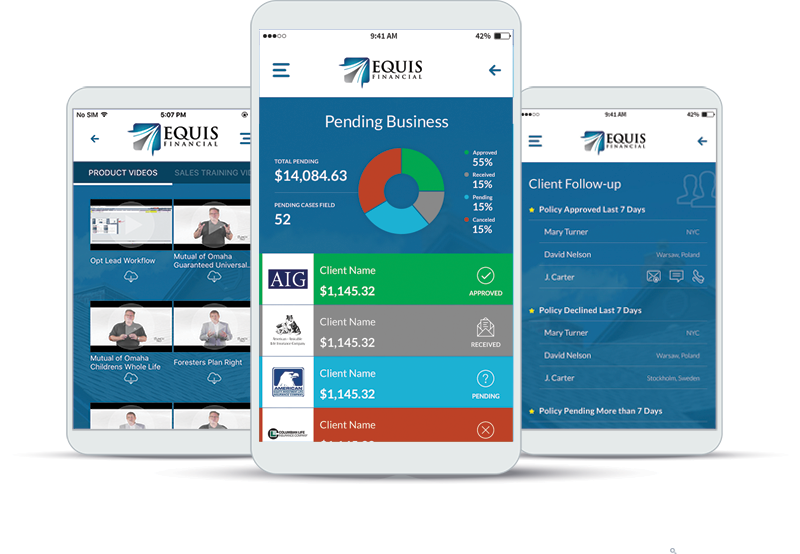 The new suite of applications enabled Equis Financial to attract talented insurance agents to work with them, a Critical Success Factor in the insurance agency business. The new improved platform helps Equis Financial to position themselves as market leader, outshining its competitors.